What if your engine quits over New Hampshire? Every pilot needs to have a bi-annual flight review (BFR). A BFR must be taken either two years after the last BFR, or two years after the last checkride, whichever comes last. I had planned to start working on my Commercial rating in the summer of 2011, so that I will have the checkride in the fall and thus skip my BFR. I’ve done it successfully two Novembers ago when I took my Instrument Rating checkride. But this year my summer was spent on other things, I started my Commercial training in mid fall, and I will not have a checkride before the end of November. So yesterday I had my BFR with John, plus I had an intro to Lazy Eights (which I will write about in a later post). 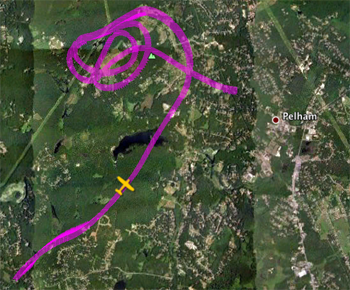 We did some airwork and then at about 4000’, somewhere between Lowell MA and Nashua NH, John pulled back the throttle and told me (wink wink) that the engine had just quit. While trimming for best glide speed and pulling the prop RPM lever to reduce the prop drag, I searched for a suitable landing site. At my altitude there was no hope of reaching the closest airport, at Nashua. I identified a meadow in the forest and started gliding towards it. John told me: did you know that this is actually an airport? No, I did not know. John pointed at some rectangular buildings and said that they are hangers. As the ground got closer, I could actually identify a very short landing strip cut in the grass. What new thing did I learn? As I was circling the designated landing site, I had to decide in which direction to land. So the obvious question, which John asked me, is what’s the wind direction. I looked for obvious signs like smoke, but could not find any. So I said, ahh, it is 250°. I was cheating of course, using the wind direction at the departure airport. John taught me how to find the wind direction while spiraling close to the ground. It’s quite trivial actually if you’re circling: watch the lowered wing tip, and note where it is travelling faster or slower over the ground. Should I have known it? Yes. Did I remember it as I was was losing altitude, preparing the plane for an emergency landing, and flying the plane? No. My first approach was not all that great – if I was actually landing, I would touch down farther from the runway end than I had wanted. I pushed the throttle (aha! The engine is working! Music to my ears! ), got back on the downwind, pulled the throttle back and executed another glide towards the runway, this time much better. At home I debriefed my flight with CloudAhoy. 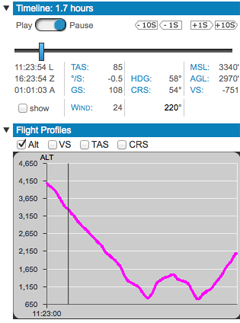 I defined a custom segment for the “engine loss”, and discovered two things: (1) on my approach I was 368’ AGL when I applied power. I was actually on the downwind executing a short approach, and looking now at the terrain and the wind I realize that I would not have not made the runway. I would have definitely survived the landing, but the plane might have been damaged. (2) It took 4:07 minutes to glide from 4100’ to 825’ MSL, which is about 800 feet/minute. I checked this against the Arrow’s POH (pg 5-31, Glide Time and Distance). It’s about what the book has – so my glide was close to optimal. That’s good to know. I should start taking gliding in the summer. The Hudson landing probably would not have been as successful had Sully not been a skilled glider pilot. I then looked up the landing site in Google. 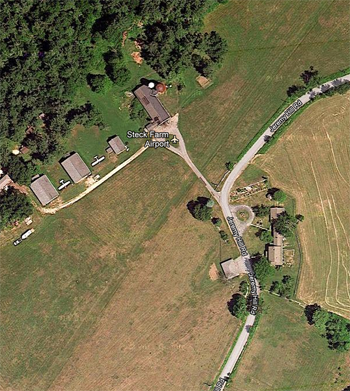 It’s called the Steck Farm, and is located on 146 Jeremy Hill Rd Pelham, NH. 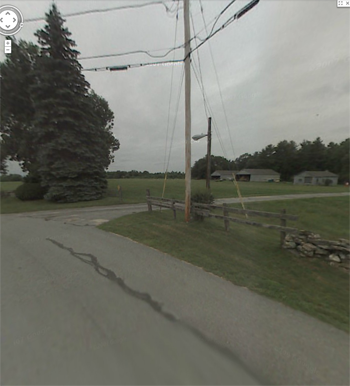 I also looked at Google’s Street View: the entrance is very rustic, and does look quite like the highway exit to Logan Airport. I tried to find more information about the farm, but could not find much other that the owner is Mr. John Steck, and the manager is Mr. Paul Steck, both of whom seem to live on the farm. Is John the father of Paul? Did the extended John and Paul families dine together on Thanksgiving in the farm? Did they fly Aunt Suzy to the Thanksgiving dinner? Turns out that the flight debriefing cannot answer all questions.